For years the hangboard reined supreme in the climbing training realm, but now campus and systems boards are commonplace along with entire hangboard centers coupled with rings, hang balls and TRX. Not only are operators installing these amenities they are offering classes in how to use them, effectively doubling down on their investment. As training areas become essential elements of good gym design, gear companies have stepped up to fill this burgeoning need with innovative products. 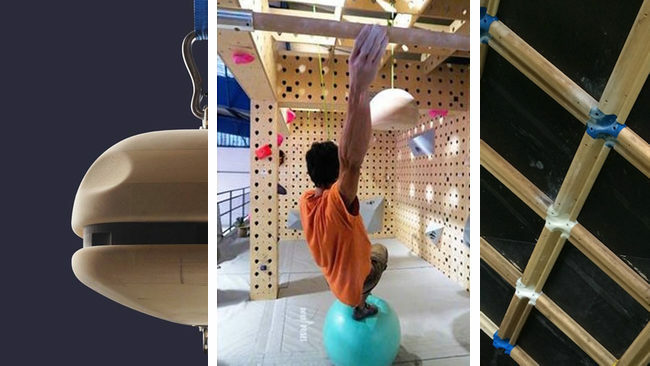 With so many options now on the market, we give you a look at just a few of the new and innovative equipment on the market that is making its way into climbing gyms. This versatile piece of equipment can do just about anything your climbers and athletes need to do. Hang it up and it’s a stability pull-up bar, clip some straps to it and it becomes a stability rings center. It can also be placed on the ground as a parallette or slung over your shoulders for a unique squat bar. Trying to maintain equilibrium while hanging may be one of the best ways to simulate the active muscles in climbing while hanging in one place. The Yoak is one of the first commercially made products to bring this very effective technique into climbing gyms. Because of the irregular nature and difficulty of routes and boulder problems, it can be difficult to create a baseline in which to compare performance. Climbing is not track & field! It’s equally as hard to know what training techniques aided the climber in their success. In fact, far too often the actual effectiveness of training programs goes unmeasured. The Lattice board hopes to solve that problem by creating a true systems wall that allows for actual movement. The board is a new breed of training device that combines analytical performance assessment with actual training programs. First developed by UK crack sleigher Tom Randall to assess pro climbers competing on the international stage, the Lattice board quantifiably tells you whether what you’re doing is actually working. For gyms or competitive teams that are serious about quantifying their teaching methods and producing medal collecting athletes, The Lattice Board is made for you. Because the board requires a fair bit of instruction and learning to use correctly, Randall and his team have created a slew of assessment and training tools that you can do via the internet. They also have online coaches that can perform assessments. Now, all it needs is an app! Lattice is slowly making a show in US climbing facilities. Currently being installed at The Crux in Austin, Texas and LEF in Lexington, Kentucky. And now for something totally different! Entre Prises has developed an entire self-supporting modular training center that can be added to your climbing gym. The walls are made of keyholes that accept a corresponding locking mechanism from a variety of training tools from volumes, balls and bars. Training and fitness trends are always changing and it can be quite hard for operators and coaches to keep up with the latest trends. But the Monkey Space allows for a seemingly unlimited array of ways to keep your climbers training their best. The space allows a coach to customize a series of moves to target an athlete’s weakness or introduce a new concept. EP is definitely making a nod to the recent popularity of ninja warrior racing as well as the trendy parkour routesetting style. And that’s what’s great about the space; the ability to modify your training techniques to match real world trends in training and routesetting. Hanging from objects is so simple and honestly a little one dimensional. Enter the Climbing Burger from Antworks. An innovative twist on the hanging “giant ball” sloper, the Burger takes it to a new level with multiple grip surfaces combined with multiple hand positions all while trying to maintain stability. The Burger could bring some fun back into your team’s training regimen!